Kyle Greenwalt is an associate professor in the Department of Teacher Education at Michigan State University. He studies the school curriculum by exploring teacher-student-parent relationships and the factors that have shaped such relationships over time. 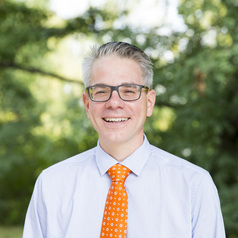 Motivated by the moral and emotional well being of children, parents and public school teachers, Kyle has published in such journals as the Harvard Educational Review, Curriculum Inquiry, Teaching and Teacher Education, and Phenomenology and Practice. Working with local social studies teachers in the state, Kyle coordinates MSU’s secondary social studies teacher preparation program. Prior to his appointment at MSU, Kyle taught high school social studies in northern Minnesota and English in eastern Hungary.